Hi folks it’s been a very busy year for me in the UK, more plants to deal with than you can shake a stick at and as for blossom bagging and sorting seed well I am just not going to go there but its all done and up to date and it’s time to get back to the Blog. So last time I was chatting away we where talking about seedlings so we will follow on from there. 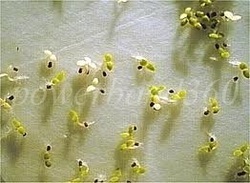 As your seedlings start to increase in size you will need to also increase the size of there pot therefore allowing there root structure to become more established and in turn boost the energy to your Tobacco plants, this process will continue for some time and moving your plants from indoors to a cold greenhouse should follow in turn. Its always a good idea to take care when moving the plants outside as cold nights can do damage, aim to move the plants to a cold greenhouse after the fear of the last frost has passed and move your plants outside during the day and bring them back in at night. So we have got past the hardening of stage and our Tobacco plants are ready to go in to the soil or are they, you see the thing about Tobacco plants is they are a very greedy crop and they grow at a fantastic rate, so what can we do to help them well to start with we can put lots of well rotted manure in the ground along with blood, fish and bone and the like I also cover the well dug ground with black weed suppressing sheet, this black weed control sheet not only prevents weed growth but also heats the soil and keeps the moisture in the ground all things that our tobacco plants need and love. May, well its around mid May in our little world (check your last frost times) and the plants are going in the ground, few about time, at this point its all a bit new for our small plants of only 5-6 inches tall and don’t worry to much as they are likely to just sit there for a couple of weeks until they get there roots established, but from then on it’s a race and I kid you not these chaps can give a race horse a run for its money, there is more than one reason they call them the weed as they grow as fast and if not faster than the a four mentioned plant, most strains get very large to, Rustica’s are the smallest at around 3-4 feet moving on to Burley’s and Virginias of around 5-6 feet and on to some Russian strains reaching over 8 feet in height. If you are growing for seed there are a few simple rules that we can use, the more plants the better as they are more likely to fight for light space and food which will in turn force them to want to reproduce and flower faster, think about it a little if you don’t over water don’t over feed and allow the plant to do its thing you are likely to obtain seed sooner. Remember Tobacco plants are self fertile so you will need to ether put blossom bags on the flower heads if you are growing more than one strain or grow them more than a mile apart as they will cross pollinate, if you are growing one strain your good to go and just harvest the seed at the end of the growing season. You will also need to remove any flower stalks that try to appear from the plant this works along the same lines as removing side shoots from a tomato plant which incidentally Tobacco plants are a member of the same family along with nightshade, it will encourage much faster and stronger growth of the leafs as the plant will put more energy into this because you keep snapping all the flowers off lol. Feed the plants 3-4 times in the growing season with a liquid fertilizer any feed that is used on tomatoes is fine. We it looks like I have run out of puff again so to speak and it will shortly be time for a nice cup of tea and a home grown ciggy and a little bit of TV before bed, i would like to thank you for reading this article, stay tuned for more info and tips, until my next blog i wish you happy growing and hope to see you back soon. The weather seems to be taking a turn for the better, well the snow has nearly thawed completely anyway, and its time for another post this time about Tobacco seedlings. After 6-20 days our little Tobacco seedlings will start the emerge from their seed coat , at first the only signs of life you will be able to see is a tiny white root tip trying to break free from the seed coat, smaller than the tip of a pin. within a few days the tiny plants will have thrown off there coat and put their roots into the moist compost. 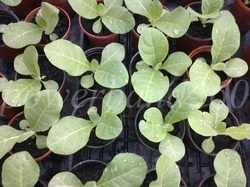 Tobacco seedlings are very vulnerable at this stage and do not like to be missed about with. many things can have irretrievable affects at this stage, over watering, under watering, heat, cold the list goes on and on, my advise is to leave the lid on your growing container and keep a tentative eye on them if they need more water don't put it directly on them allow the water to slip down the side of the container and the compost will draw it up by way of capillary action. The tiny plants really don't need anything at this point in time just water and light, once the seedlings are near to the lid of the container they will be about 5-10mm in height and resemble quite closely Mustard seed like we use to grow on the the windowsill as a child. Pricking out, you could leave your seedlings to get larger if you like but i fell even though this is a finicky job its best done at this stage, otherwise the roots of the seedling can become entangled and cause more trouble than need be. the way i approach this is with a tooth pick a small knife and a clean surface to place them on, make sure you already have some small plug planters filled with compost and ready to go. I use the knife to cut out a small section of compost with the seedlings in, a peace perhaps with say 10 plants in, now i place them on a clean surface and gently tease them apart with the tooth pick, once you have them separated you can make a small hole in the compost of the plug planters for the seedling to go into. Now here is the really tricky bit you will need to pick up the tiny seedling with you fingers taking care not to damage or bruise the leaf move across to the plug planter and place the seedling root straight into the hole you made, back fill the tiny hole with compost by means of the tooth pick and your done, as the seedlings grow you can plant them up into bigger and bigger pots until its time to plant them out in the garden. At this point i think its time to take a breather, and go and have a cup of tea and watch some TV before bed. i would like to thank you for reading this article, stay tuned for more info and tips, until my next blog i wish you happy growing and hope to see you back soon. Here in the UK we are rapidly approaching the onset of spring although you really wouldn't thing so, looking out of my conservatory window all you can see is the dreaded white stuff and daytime temperatures find it hard to creep above zero, this makes for a good time to put our Tobacco growing plan for the forthcoming year into action. first and foremost im sure you are thinking about what Strain to grow or perhaps you have already obtained your seed and just cant wait to get going. Let me be the first to congratulate you on your first steps towards the amazing world of Tobacco growing, in this post i thought i would try to elaborate somewhat on Tobacco seed and information obtaining to them. 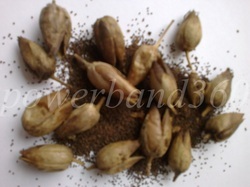 So how many tobacco seeds do you get too 1 ounce well this really depends on the strain of Tobacco, all Tobacco seed is very small indeed but as a rule you are looking in the region of 300.000-400,000 seeds per ounce and most Tobacco seed has a germination rate of between 70-90 percent, the seed also has quite a long viable germination span around 2-3 years. Before sowing your Tobacco seed i would give some thought to how many you want to grow, i use the flowing theory. Sow 2 for me, 2 for the snails, 2 for germination and 2 for the weather this way you will be sowing at a ratio of 1:3, so however many seedlings you need to plant out into there final position times is by 4. I then fill the plug planters with a good seed sowing compost this will have enough nutriments in to last until you are ready to transplant the seedlings, its a good idea at this point to moisten the compost before sowing the seed, never water directly onto the seed they are so incredibly small that the water could just wash them down the side of the plug. Once you have your compost moist sprinkle seed very sparingly over the surface of the compost and place the lid on-top, this will act like a tiny greenhouse providing the ideal environment for your seed to flourish into strong little seedlings. Now its time to just sit back and wait, germination can take anywhere from 6-20 days so be patent. At this point i think its time to take a breather, looking out of the window the snow seems to be thawing so i have probably gone far to deep into this subject buy now, i would like to thank you for reading this article, stay tuned for more info and tips, until my next blog i wish you happy growing and hope to see you back soon.